Congratulations to our Annual Fund Volunteers in each of these classes for the outstanding work that led to these winning results. We are most grateful! Recognizes the undergraduate classes that have the highest percentage of members in The President’s Society. Recognizes the undergraduate classes that raise the largest amount of money. Recognizes the undergraduate classes with the highest percentage of members participating in making a gift to the Annual Fund. Recognizes the undergraduate classes with the highest percentage of members in The 1749 Circle, which recognizes and honors the loyal alumni, parents, and friends who support the University consistently. 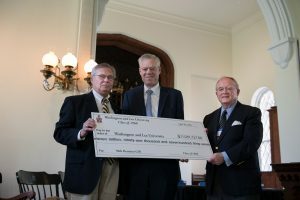 These individuals have made a gift to W&L year after year without fail. Recognizes the class with the largest number of members registered at Alumni Weekend. Winner: The Class of 1968 (50th reunion) with 40 percent of the class in attendance. Winner: The Class of 1968 (50th Reunion) with 60% of the class making a commitment. Winner: The Class of 2003 with 74% increase in their one year Annual Fund total. Winner: The Class of 1988 with $904,245.95, the largest reunion gift to the Annual Fund.